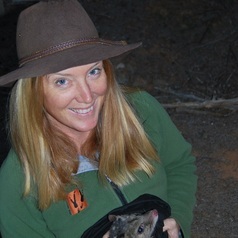 I have a PhD in reintroduction biology and specialize in arid zone ecology and reintroduction biology of Australian mammals. I have over 20 years experience in wildlife ecology and have published more than 40 peer reviewed scientific articles. My main interests lie in preventing extinctions of Australia's fauna and flora, improving methods for controlling pest animals and studying the interactions and adaptations of arid zone fauna. I am a co-founder of Arid Recovery in northern South Australia and the Middleback Alliance on the Eyre Peninsula. I am an adjunct lecturer with the University of Adelaide, director of Ecological Horizons Consultancy and part time Research Scientist with Arid Recovery. I live with my partner and three children on our privately-owned nature reserve, Secret Rocks.